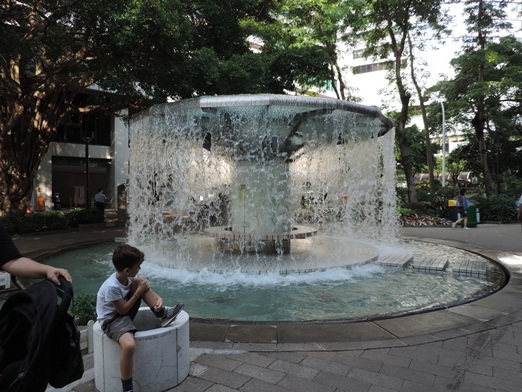 My son and I traveled to Hong Kong for the first time last October 2017. 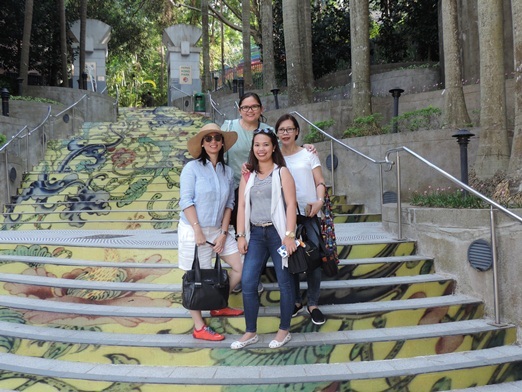 I was actually just an accidental tourist because parents were not required to accompany their sons to the the LSGH Grade School Student Council Officers Leadership Immersion and Benchmarking Program in Kowloon. But because it’s my son’s first time to travel outside the Philippines, I simply had to be around to see that he’s okay. Well, we weren’t actually together during the 5-day trip because we were billeted on different places, but it gave me peace of mind knowing that I was just nearby in case my presence was needed and also because his Dad wanted me to be there, too, despite the extra expenses. 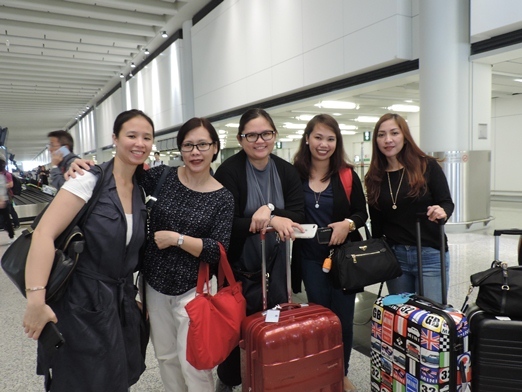 I, together with four other moms whose sons were also in Hong Kong for the SC leadership program, stayed at the Hyatt Regency Hong Kong, Sha Tin. While I didn’t have a photo of our adjoining rooms, we really had a comfortable stay at this elegant hotel. Also, the hotel’s location was convenient for us because it’s adjacent to the University MTR station which allowed us to travel to and from the hotel with ease. On our first night in Hong Kong, we visited our boys at their YMCA dorm in Kowloon. 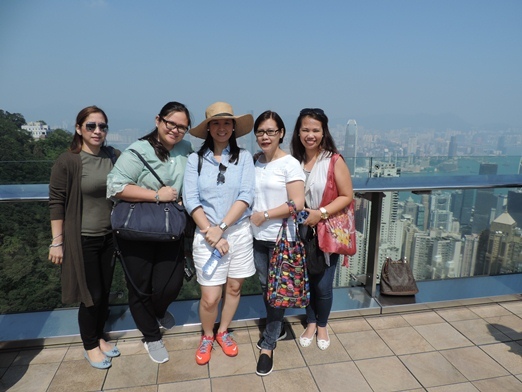 On our 2nd day in HK, our mommy group visited The Peak Tower. The Peak Tower a.k.a. 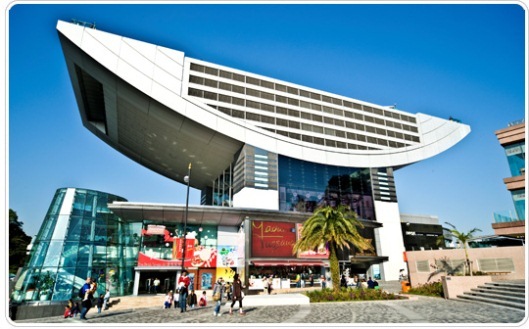 The Peak is a popular, stylish and modern architectural landmark in Hong Kong that houses various shops, restaurants and entertainment places, including the Madame Tussauds Wax Museum and the Sky Terrace 428. They say you’ll have the ultimate Peak experience if you’ll buy a Peak Tram Sky Pass, so that’s what we did. This allowed us to ride the Peak Tram and enjoy the wonderful views at Sky Terrace 428. 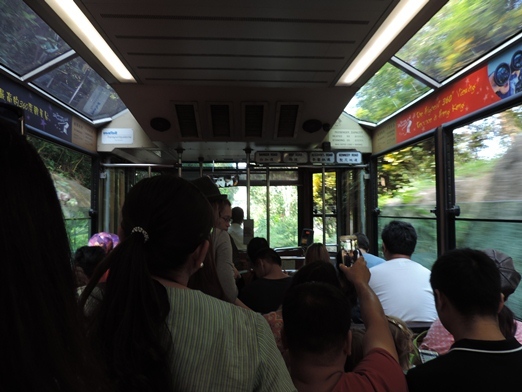 The Peak Tram is the quickest way to get to Sky Terrace 428. 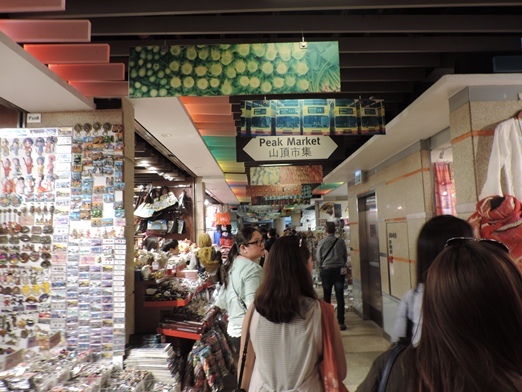 Tourists can buy souvenir items for their family and friends at the Peak Market. 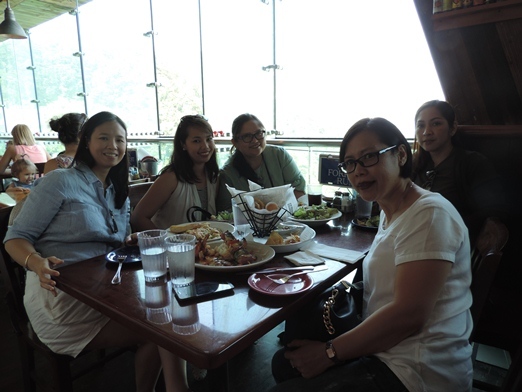 Having lunch at Bubba Gump Shrimp Co.
We stopped by Bubba Gump restaurant first to have lunch. 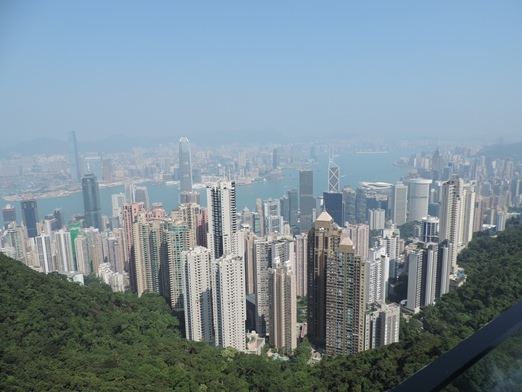 The Sky Terrace 428 is the highest viewing platform in Hong Kong. The Sky Terrace 428 gives a breathtaking 360-degree panoramic view of the city. We also had fun and wacky photo moments at Madness 3D Adventure located at Level 1 of the Peak Tower. On our way back to our hotel, we passed by Hong Kong Park. 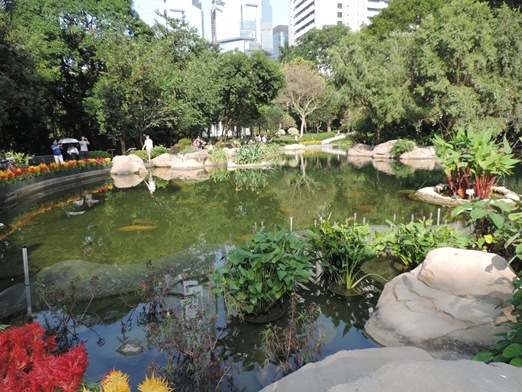 Hong Kong Park is an 8-hectare public park in Central Hong Kong known for its beautifully landscaped gardens and water features. 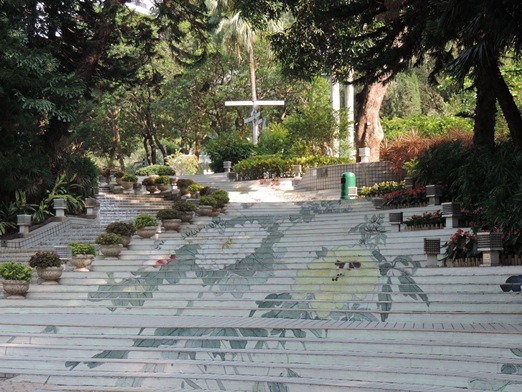 Some of the park’s major attractions include an aviary, a conservatory and children’s playground, among many others. 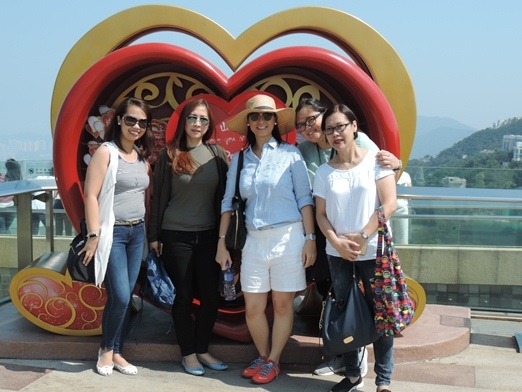 Our 3rd day in Hong Kong was spent shopping at Tsim Sha Tsui and Mongkok, but I have no pictures to show. Sigh! Our 4th day was spent at Hong Kong Disneyland with our boys, which deserves another blog post. 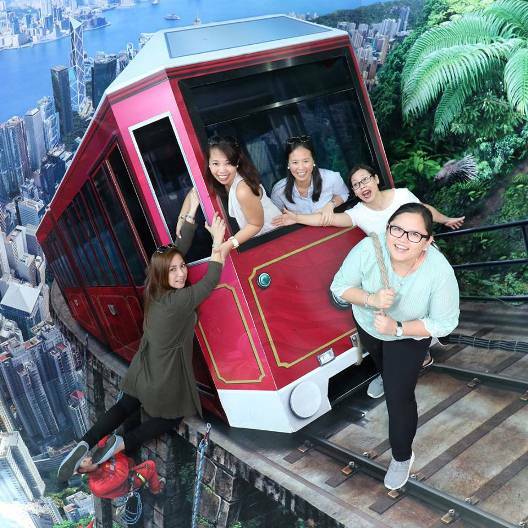 This entry was posted in Hong Kong, Hong Kong Park, Madness 3D Adventure, Peak Market, Peak Tram, Peak Tram Sky Pass, Sky Terrace 428, The Peak, The Peak Tower. Bookmark the permalink. I am impressed that the school of your son has a leadership program which includes giving students the opportunity to be exposed to other cultures and their leadership styles there. I think this is key in molding the youth of today to become even more better leaders tomorrow, the future. It’s also nice that parents are welcome to travel with them. It’s so nice to go out and bond with other parents from your kids’ school. I remember meeting a lot of parents during PTA meetings and how we all ended up as friends up to this day. Nice to see your happy smiles and that everyone seemed to have a fabulous time! Thomas Clark on Good Health Is Expensive! Tiffany Joy Monera on Vigor-ACE Soft-Gel Capsule: Product Review and Giveaway! Get the Best Deals from Lazada’s Biggest Baby Fair Happening on January 22 to 24! A Pink Christmas It Was! © 2018 Pensive Thoughts. Look At Me theme created by Squeesome.